Hi Jason, I'm making the switch to professional grade LED Christmas lights this year. But I'm perplexed by all the various lens designs and I'm at my wits end trying to figure out what is the best Christmas lights for outdoor foliage lighting. Please Help! Gary, this is a question that comes up quite frequently. And it's an important question. 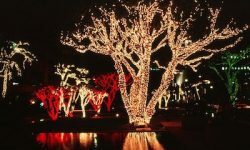 That's because lighting the foliage of a property can lift a Christmas display from the average and mundane to the spectacular. Think of the last time you went cruising the streets to gawk at holiday displays. Which displays make you tap your brakes and just pause for a moment to soak in the grandeur of a spectacular homage to Christmas? Was it a property where only the house was lit up? Or was it a property where the love for Christmas overflowed from the home and spread out into the landscape, climbing trees, gilding bushes, and tracing walkways and lawn borders with brilliant, laser-straight lines of light? Of course, the displays that really grabbed your attention were those that lavished lots of lighting love on the outdoor foliage. So it is an important question. But as answers to important questions often tend to be, the answer to this question is a little bit complicated. The answer is loaded with lots of "it depends" because the best Christmas light for decorating outdoor foliage is very much in the eye of the beholder. Essentially, it comes down to a matter of personal preference. So let's just discuss the three most popular choices for lighting outdoor foliage. Perhaps the discussion will guide you to the best choice for lighting your outdoor foliage. I didn't flip a coin in deciding which type of light to discuss first. I placed 5 mm Wide Angle Conicals at the top of the list for a very specific reason: It's the most popular choice for lighting outdoor foliage. That's based upon sales; we sell more of this style of light set than any of the other light set. In fact, Conical light sets outsell all other styles, combined!. But it's also based upon our knowledge of the community of professional Christmas light installers. 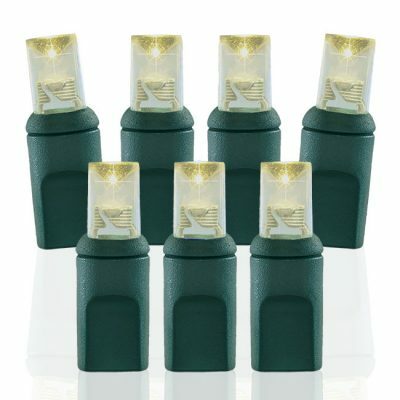 We know that Wide Angle Conicals are the hands-down #1 choice among professionals for use in lighting outdoor foliage. And the installation department of our company that focuses upon providing professional lighting services uses these light sets almost exclusively when lighting outdoor foliage. What makes these bulbs so popular? It's primarily because of a combination of durability and appearance. These bulbs are particularly suited for the harsh conditions of outdoor use. The lens design is small and very rugged, They'll stand up to years of constant exposure to the wrath of Mother Nature. That's an obvious advantage for a professional lighting installer trying to make a profit. But it's good for the budget of individual Christmas Enthusiasts, too. 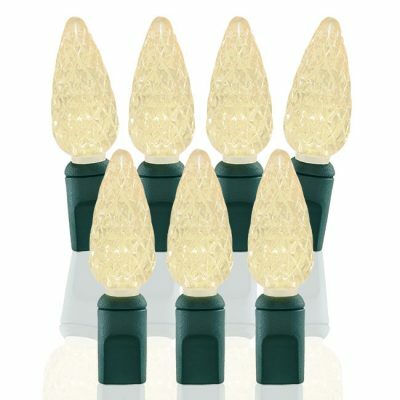 Wide Angle Conicals also offer a distinctive appearance that most Christmas Enthusiasts find quite enchanting. 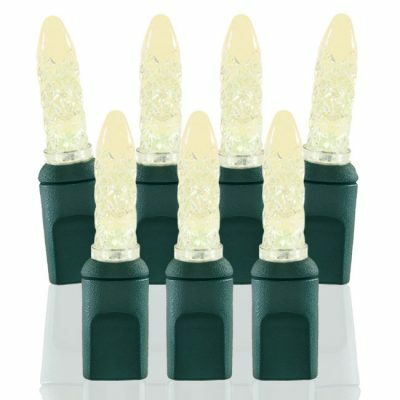 These bulbs, in fact, are the most brilliant LED Christmas lights on the market. That's because of a combo of the unique shape of the bulb and the intensity of the diodes within. One other point about wide angle Conicals: For those nostalgic about the look of the traditional incandescent mini lights that were wildly popular for decades, this bulb comes closer to matching that look than any other LED bulb. M5s are about the same size as Wide Angle Conicals. But they provide a very different look. The light of an M5 is less intense and much more evenly distributed than Wide Angle Conicals. Where the light of Conical bulb is bright and brilliant, the light of M5s is more of a warm and cheery glow. It's an important distinction, because the two bulbs produce quite a different visual impact. Another point of difference with the M5 is the distinctive glow created by the multi-angled, faceted surface of the bulb. That unique bulb design provides a unique benefit: The intensity of the light emitted from the bulb is pretty much the same no matter the line-of-sight angle at which you view the bulb. 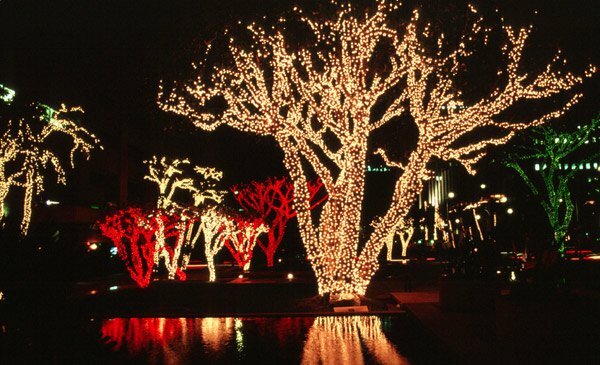 That can be a very advantageous quality when you're using the bulb for lighting outdoor foliage. C6 LED light sets are also quite popular for lighting outdoor foliage. The C6 is a bit of a departure from both Wide Angle Conicals and M5s. That's because of the size of the C6; it's a larger bulb, but it still provide the traditional teardrop-shaped look that many people prefer. So if you don't want to go with a mini-sized bulb for your foliage, the C6 can be a great choice. It's larger than the M5 and wide angle conical, and yet is unlikely to overwhelm wintertime foliage as would likely happen with larger bulbs. As a side note, be sure and give C6s a try in artificial greenery such as wreaths, trees and garlands. They offer a unique, eye catching look for both indoor and outdoor artificial foliage lighting applications. All of the above bulbs would serve you well in lighting your outdoor foliage. Between the three it really just comes down to a matter of personal preference. But we'd recommend that for most outdoor foliage lighting applications, do not use either C7 or C9 light sets. The reason? They're just a bit too large for the purpose; and in some cases they tend to overwhelm wintertime foliage. Additionally, the larger bulb size makes them susceptible to falling out of the foliage of trees or slipping down if used for trunk wraps. The exception, though, is if you're lighting an evergreen tree and want to have larger bulbs scattered throughout the greenery. In situations like this, a C7 or C9 stringer set is the preferred choice when compared to the other smaller lens designs. Due to the rigidity and fullness of an evergreen, you will not have the problem with the heavier light sets slipping from the tree. If the above information leaves you undecided about your choice for lighting outdoor foliage, then know this: Any of the three - 5mm Wide Angle Conicals; M5 mini lights; C6 LEDs - will serve you well. You really can't go wrong with any of them. And if it's an evergreen tree, then by all means, go with a C7 or C9 LED stringer light set. But if you just can't decide between them, our suggestion would be to go with the most popular choice: the 5mm Wide Angle Conicals. It's a safe choice, and one that you won't regret. Of course, the best way to find out which light you prefer is to buy some of each. Set them up in different portions of your landscape, and see what you think. It's likely you'll develop a preference for one of the three. And then you can make that bulb your go-to light for years to come for lighting your outdoor foliage.